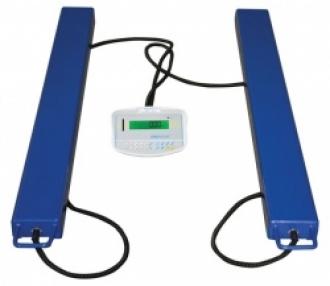 Weigh beams are fully portable weighing scales, and their unique construction means they can be used to weigh a whole variety of items, be it conventional pallets or any awkwardly-shaped cargo. They are incredibly simple to calibrate, to use and to read, and they can help to dramatically speed up operations in any workplaces that requires weight to be recorded. SKU: aelp-pallet-beams. Categories: Floor Scale, Industrial. The main purposes of weigh beams are convenience, efficiency and ease of use. The beams themselves are incredibly simple to set-up and use, and they have a clear LCD display that are highly visible and easy to read from an average distance away. They have mains-rechargeable batteries which can be pumped up to full power easily, and will last for many hours of use. The beams don’t need to be calibrated, they come in working condition straight out of the box.